That's No Bottlecap! Hiker In Israel Finds Rare Gold Coin : The Two-Way A hiker in Israel found a gold coin so rare that Israeli archaeologists say there's only one other with the same symbols known in the world. The front of the rare coin found by a hiker in northern Israel. Glint in the grass? Often, it's not even a nickel. But last week, Israeli Laurie Rimon spotted a gleam while on a hike in northern Israel with several friends. It turned out to be a gold coin so unusual, Israeli archaeologists say there is only one other one with the same symbols in the world. "It's extremely exciting," said Dr. Donald Ariel, an expert with the Israel Antiquities Authority, in comments released by the agency, which says the coin was struck by Roman Emperor Trajan in the year 107. "His gold coins are extremely rare." One side of the gold disc shows an image of Augustus, the founder of the Roman Empire more than a century earlier. The other has symbols of Roman military legions. The back of the rare coin. 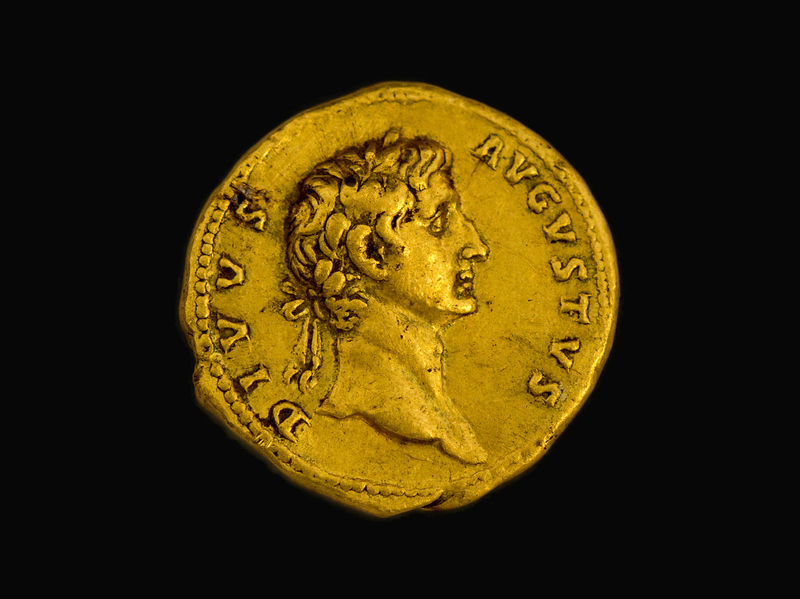 Israeli archaeologists believe Trajan made the coin to honor Augustus. Ariel says at that time gold coins were used only for high finance — and to pay soldiers when silver was unavailable. But they were worth so much — one gold coin would cover a month of a soldier's salary, according to Ariel — that they were difficult to actually use. "When the Romans didn't have, for some reason, their regular silver coins to pay soldiers, they would pay three coins every quarter to the soldiers instead of the regular 75 silver coins," Ariel said. "But when the Roman soldier received this coin, what could he do with it? He couldn't buy anything in the market, in town. It was far too much money." Ariel says soldiers would have to beg the paymaster to change their gold into something spendable. 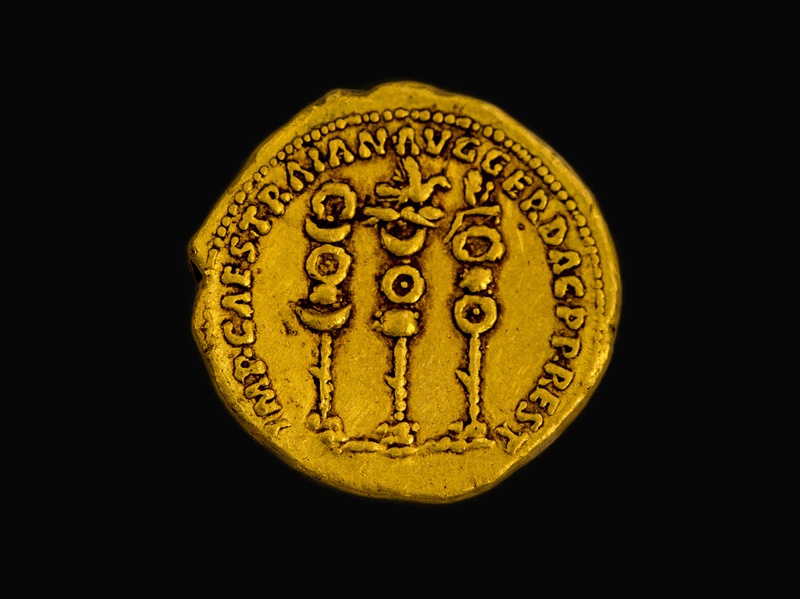 He speculates that the find — the only coin minted by Trajan found to this day in northern Israel — could give some clues to the Roman army presence in the Galilee area at that time. Jews and Roman rulers fought several wars between A.D. 66 and 135, including before Trajan's rule, when an ancient Jewish temple was destroyed in Jerusalem. Antiquities officials said Rimon, the hiker who found the coin, told them it was "not easy" to part with her find. "It's not every day one discovers such an amazing object," she told the agency representative who came to inspect and collect it. The Israel Antiquities Authority plans to give her a certificate of appreciation for turning it over to authorities. They hope to display the coin publicly soon.